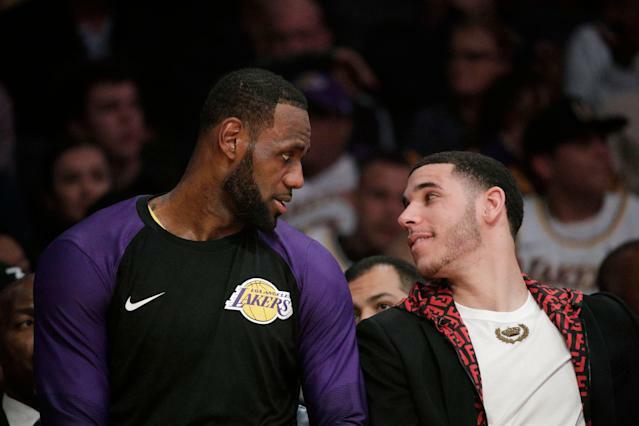 Lonzo Ball is already LeBron James’ teammate on the Los Angeles Lakers. Could he join the superstar on a more fictional team as well? Ball was asked on Bleacher Report’s House of Highlights Show about James coming to Los Angeles. That naturally led to the question of whether Ball could be in the upcoming “Space Jam 2,” and Ball didn’t deny that he liked the idea. “You’ve gotta ask him. I’d love to be in it, we’ll see what happens,” Ball said. While Ball is only signaling he’d be interested in appearing in “Space Jam 2,” that’s a more positive response than most of the league’s stars have reportedly had. Stephen Curry, James Harden, Kevin Durant and Giannis Antetokounmpo are already reported to be out, though that may have more to do with shoe deals than James’ charisma. Considering that Ball appears to be gravitating toward a Nike deal, something that James has cheered on, he could at least be a fit for the movie in that respect. No one is going to mistake Ball’s talent for that of Curry or Harden, but the young Lakers point guard obviously holds plenty of star power — for better or worse — and that could make him valuable to a movie. The movie isn’t scheduled to come out until July 2021, so there’s plenty of time for a decision to be made. And let’s face it, LaVar Ball rooting for, or coaching, the Monstars is something that plenty of people would pay to see.